Indication For the relief of the inflammatory and pruritic manifestations of corticosteroid-responsive dermatoses. Pharmacology Alclometasone is a synthetic corticosteroid for topical dermatologic use. 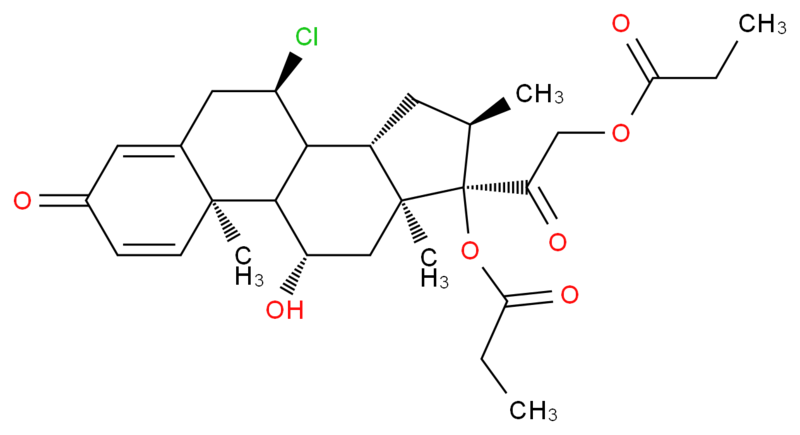 The corticosteroids constitute a class of primarily synthetic steroids used topically as anti-inflammatory and antipruritic agents. Alclometasone is a selective glucocorticoid receptor agonist. Toxicity Symptoms of overdose include suppression of adrenal glands, temporary decrease in white blood cell counts, symptoms of hypersensitivity (such as skin rash, hives, itching, and difficulty breathing), and increased susceptibility to infection. Absorption Topical corticosteroids can be absorbed from normal intact skin. Studies have shown that approximately 3% of steroid is absorbed during 8 hours of contact with intact skin of normal volunteers.